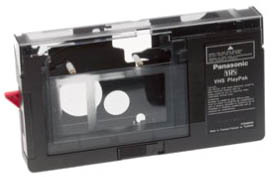 In response to demand for smaller video cameras in the 1980s, Panasonic launched the VHS-C format. The VHS-C tape is basically a smaller version of a VHS tape — it uses the same type of tape but a smaller length (usually 30 to 60 minutes) in a smaller cassette. The technical specifications are essentially the same as VHS, although the smaller mechanical parts in VHS-C camcorders do have a slight performance disadvantage compared to full-sized VHS. Note: The S-VHS-C format is the same as VHS-C but uses S-VHS (Super VHS) tape. To playback a VHS-C tape in a normal VHS machine a battery-powered cassette adaptor is used. The VHS-C tape is inserted into the adaptor which threads the tape into a configuration just like a full-sized cassette. The Video8 format was the main competitor for VHS-C during the 1980s. While Video8 was widely considered to be the better format, VHS-C had the strong advantage of being compatible with the ubiquitous VHS machine. Although Video8 did fare better than VHS-C overall, the two formats waged a relatively evenly-matched battle until the advent of digital video formats.